Product prices and availability are accurate as of 2019-04-10 05:30:38 EDT and are subject to change. Any price and availability information displayed on http://www.amazon.com/ at the time of purchase will apply to the purchase of this product. These bits come with a nice solid wood case. included sizes are 1/4",3/8",1-2",5/8",3/4",7/8",1",1-1/4",1-3/8", and 1-1/2". 3/8 in. shank size, 10 pieces. 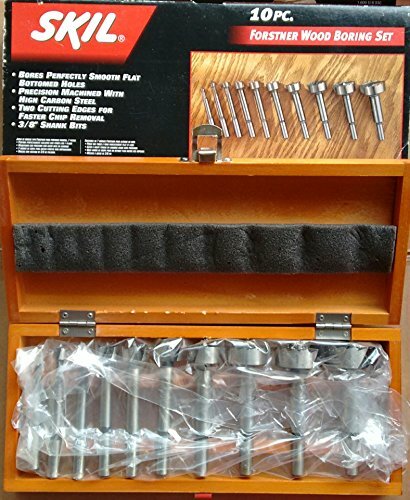 forstner bit set and wooden storage box Sizes are 1/4, 3/8, 1/2, 5/8, 3/4, 7/8, 1, 1-1/4, 1-3/8 and 1-1/2 in. For boring sides and flat holes. Uses drill presses and drills with 3/8 in, 1/2 in. chucks.